← What can we learn from the Fernie Ammonia fatalities? Process Safety managers are often buried under a torrent of Findings and Recommendations from PSM/RMP elements such as Employee Participation (EP), Process Hazard Analysis (PHA), Pre-Startup Safety Review (PSSR), Incident Investigations (II), and Compliance Audits (CA). Failing to respond to the Finding / Recommendation. Failing to document the response to a Finding / Recommendation even if it was addressed. Assuring the situation is safe in the interim. Implementing an interim solution to ensure the process is safe during the delay. Let’s look at each of these and discuss how Process Safety manager typically fail, and what YOU can do to avoid common failures. Solution: Ask questions about the reason for the Finding / Recommendation. Don’t let someone tell you that something has to be done a certain way without an adequate explanation. Many unnecessary Findings / Recommendations can be avoided or solved simply by asking the person making it to provide their actual reasons for it. This isn’t about feelings. Ask for the specific hazard, regulation, code, standard, etc. You can’t judge a Finding / Recommendation without understanding it, and neither can management. In the case of legitimate Findings / Recommendations, understanding the issues behind the Finding / Recommendation will help you gain momentum to address the problem. Solution: Don’t prejudge. That isn’t your role. Your role as the Responsible Person is to bring these issues to the people that are in charge of the process. Ask the right questions and present the necessary information to management. THEY are responsible for their decisions after that. Your role is to document their responses and remind them if you haven’t received adequate direction on the disposition of the Finding / Recommendation. Where the Finding / Recommendation came from. Why the recommendation was made and the the actual text of the Finding / Recommendation. When the Finding / Recommendation was made. 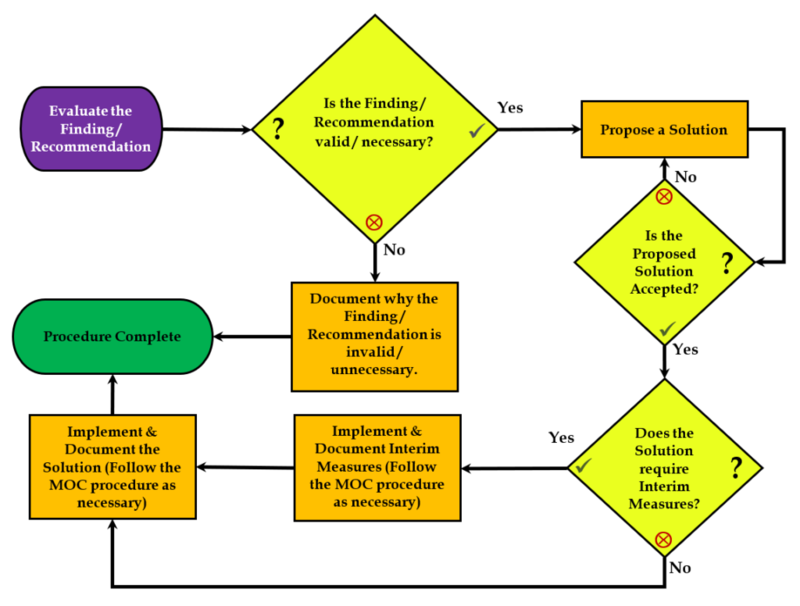 When the Finding / Recommendation (and any interim measures) are to be completed by. When activities on it occur and, ultimately, when it is marked as fully addressed. Who is Responsible for it. What has been done, is being done, and is planned to be done. If you’ve implemented a system to track Findings / Recommendations, then this shouldn’t be an issue. Where most people fail here is not documenting what they are told. An example: you bring up a recommendation during a conversation with management and they give you an answer, but you don’t document that verbal answer in your tracking system. Even better, when you are given verbal answers to a Finding / Recommendation, either document that answer in the meeting notes or in a follow-up email to the person that gave you the verbal answer. Put simply: Either shut it down or ensure it’s safe to operate while you are planning & implementing your response. First, we need to evaluate the condition of the valve station. Is it so bad that you don’t know if it’s safe? If so, shut it down until you can evaluate it further. Document this decision and the reasons for it. Is it mild surface rust such that it just needs cleaning and a fresh coat of paint? Either clean and paint it right away or document why it’s safe to operate until when you plan on cleaning and painting it. This entry was posted in Compliance and tagged PSM, RMP, Standardization. Bookmark the permalink.